Both children and adults like to draw with markers, but to do that you need the right kind of paper to be able to take the ink. 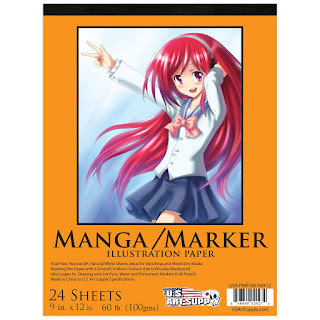 This Manga Marker Paper Pad is perfect for this sort of medium. No bleeding, or rips in the paper while first sketching, and then later filling in with Marker. My oldest child loved to draw with pencils when he was little no color until he was a teenager but he did try different mediums. While my middle child love to use color, lots of bright bold colors and chooses marker or paint over pencil. Either way this Pad will fit your needs. You can find this Manga Marker Paper Pad on Amazon. What U.S. Art Supply has to say about their product. Disclosure: MarksvilleandMe received one or more of the products mentioned above as part of a promotion with Tomoson and U.S. Art Supply. Regardless, MarksvilleandMe only recommends products or services we use personally and believe will be good for our readers. Some of the links in the article may be “affiliate links.” This means if you click on the link and purchase the item, I will receive compensation. If you would like MarksvilleandMe to review a product or service please contact us at marksvilleandme@gmail.com.